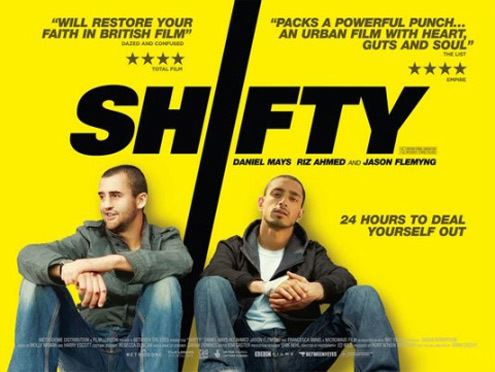 Shifty is an independent social realist film that borrows (in terms of genre conventions) from the Crime Thriller/Gangster film, although arguably is not a hybrid genre. The film was produced with key funding from fledgling organisation Microwave who offer grants to film makers if they can keep the production budget under £100,000 and can execute filming in less than 18 days. Additional funding for distribution came from the UK Film Council’s P and A Fund (£200,000) allowing for 51 prints to be distributed. Shifty’s production company was Film London working in conjunction with BBC Films suggesting an agreement has been made on TV distribution, similar to first time director Saul Dibb’s Bullet Boy (2006). This reflects the BBC’s increasing involvement in British film after many years of criticism that its main interest was only TV genre. With many British independent films, e.g. Vertigo’s Football Factory and Shane Meadow’s This is England distributed by Optimum the theatrical release was a marketing platform for DVD sales where it is hoped the film will break even or potentially make a small profit – the film remains critically opposed to commercially successful. Arguably Shifty has a primary and secondary target audience with initially the urban youth audience, Kidulthood / Adulthood market targeted, 15-21, aspirers C2, D and E and then an older, more educated target group, 25-45 with more significant cultural capital, ABC1 individualists who embrace film culture.